Sennheiser Momentum 2.0 On-ear review | What Hi-Fi? Kaspar van Beethoven, Theo van Gogh, Augustus Dickens: proof that not all sibling rivalries end in a draw. Even trickier for these Sennheiser on-ears, the middle of the Momentum 2.0 children, is that they’re vying against two Award-winners in the family. But the original Momentum on-ears didn’t fare too badly at all when we tested them a few years ago, lacking only a little midrange clarity that came between them and five stars, and, though they’ve their work cut out living up to their esteemed siblings, we really don’t expect these second generation headphones to be far off the pace. 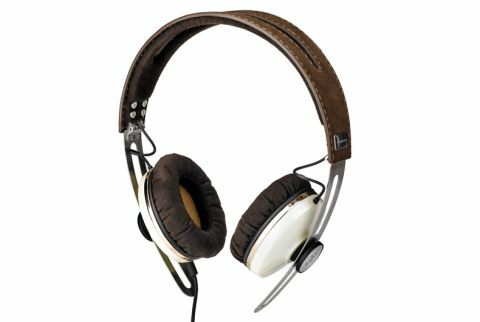 At a glance, there’s little to tell the difference between these Momentums and their predecessors; the pair we’re reviewing has the same cream ear cups with brown Alcantara-covered foam padding and headband – Alcantara being a polyester and polyurethane composite that to the touch is similar to suede – as we saw a few years ago. Evidently, looks like these don’t fade. Cannily, though, Sennheiser have added a couple of ball joints to the headband, meaning you can fold them away tidily to fit inside the provided carry case. Isn’t it so often the little things, eh? And speaking of those, you’re still equipped with a three-way inline mic and remote, though the Momentums’ 1.4m cable is also still interchangeable if not entirely to your liking. Our first thoughts upon playing Kiasmos’s self-titled album is that not only do these second generation Momentums look a lot like their predecessor, but sonically they share many of the same traits as well; that, to us, is sign a company is sure of what it’s trying to achieve. In this case, it means a lot of body and warmth, such as with the padded chords and reverse-delayed synthesizer notes that open this album with a blanket of sound. There’s plenty of detail and texture here as well, but there’s tenderness there, instead of too much analysis, that makes for an effortless and enjoyable listen throughout the album. You get more of a feel for that solidity and, in particular, bass weight as we get to those processed kick-drum beats that drive the album, albeit often in the left-hand lane of a dark and empty motorway. Of course, the amount of low end to be heard in a mix is somewhat a matter of taste; though we’d prefer an even balance to scraping the depths of low frequencies, the amount of bass here does aid that sturdiness of the sound and steers just the right side of becoming invasive. When we play Welcome To My World: The Music Of Daniel Johnston, we also learn how forgiving these Momentums are. Most of these songs were recorded on a tape recorder in Johnston’s room, but, though there’s enough transparency so as not to be deceiving, it isn’t ever so coarse or lo-fi to become overly difficult to listen to. That, especially for a pair of headphones at this price, which will be used to listen to recordings and file types of all levels of quality, has to be to Sennheiser’s credit. In summation, it’s a full and pleasant sound of which we don’t get bored. But comparison with Philips’s Award-winning Fidelio M1MKII also highlights a few of the Momentums’ flaws. Though the latter pair are certainly more solid and carry more low end, the former offer a clearer and more evenly balanced sound, which in turn digs out more detail, times better and expresses more in terms of dynamic reach for what, we believe, is an overall more musical performance. In effect, Philips has more of an all-rounder. But that doesn’t necessarily make the Momentums a bad choice. If, as ever, you accept there will be compromises to be made at this, and in real terms any price point, it is then a case of which you are more willing to make. If a solid, detailed but forgiving sound is what you’re after, you’ll not tire of listening to these talented on-ears.